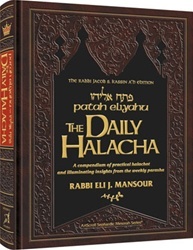 The Daily Halacha is a thoroughly original and thought-provoking new book by one of the Syrian community's most dynamic and inspiring young leaders, Rabbi Eli J. Mansour. Written in the style of the renowned Ben Ish Hai, the book features a brief, yet powerful, discourse on each week's parasha. Taken individually or as a whole, the essays deliver a timely and compelling message regarding the Torah Jew's role in the modern world. 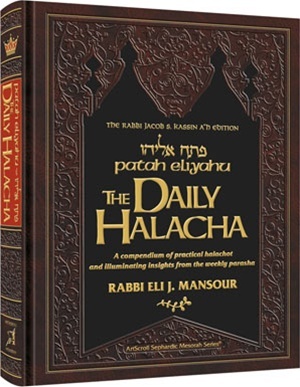 Interwoven between each parasha are halachot -- over 300, in total -- that are applicable to every person's daily life. Presented mainly in question-and-answer format, the halachot cover such topics as avelut, berachot, berit mila, kashrut, tefila and more. The book also includes extensive responses on Shabbat as well as on general topics like avoiding anger, use of nicknames, business ethics. Many of the halachos discussed present the accepted Ashkenazi practice in addition to the Sefaradi tradition, and each response is replete with the sources for the Halachic rulings. Comprehensive bibliographical and biographical appendices are provided at the end of the book. Sefaradi and Ashkenazi readers alike are sure to appreciate the beautifully-written and illuminating essays in The Daily Halacha and will undoubtedly come away with broader knowledge and a deeper understanding of halacha.